Reader Sharon G. Whitney simply couldn’t wrap her head around what the Delaware County, Indiana, Circuit Court thought it was doing in 1890. That was the year, she reported, that the United States Bureau of Pensions finally got around to awarding a pension based on a deceased Civil War soldier’s service. It gave benefits to his widow for the period from February 1877 to February 1882, when she remarried, and then it gave benefits to the children from the date of their mother’s remarriage to the day before each turned 16. That’s when the Delaware County Circuit Court appointed a guardian for those minor children. And it didn’t appoint their mother. Instead, it appointed their paternal uncle — their father’s brother. The answer is simple — and infuriating to a 21st century woman: because somebody had to be legally responsible for the children’s money — and women weren’t taken very seriously by the law at that point. But when she remarried, the money wasn’t hers any more. It was to go to the children, up until each of them turned 16. Now… in our 21st century experience, we’d all expect the mother to be the natural choice to handle the children’s benefit. That’s certainly the way it’d be handled in most cases today. And that’s exactly what happened in Sharon’s case: the mother was bypassed by the law as entitled to “reverence and respect” but not to legal power, and her late husband’s brother was named the guardian instead. That doesn’t mean the children lived with him. In all likelihood, they would have remained with their mother and her new husband. But the legal authority over the money they were receiving from their father’s pension would have been with their uncle, not their mother. It’s taken a long time for the legal rights of women to evolve and there are still a few wrinkles in state laws and many more in other countries. We should not take for granted the rights we currently have, and in fact, there is still no Equal Rights Amendment. Considering the rights of women at this time, maybe the uncle was the more likely one for guardianship of these funds. Perhaps in all their wisdom, they did not want the new husband benefiting in any way, like maybe he married her to get those funds. The risk that the funds would have been used by the new spouse was always a concern, Stan, and one reason why the guardianship would have been required. Ironically, in this particular case, the uncle was eventually removed from guardianship and prosecuted by the Bureau for embezzling the remaining minor’s pension (over $1000), running out of state with another man’s wife, and abandoning his own wife and small children. This is all in the pension file of the children’s deceased father and his widow. I have a guardianship with no reason for it. The father was still alive and I can’t find any information about the man made the guardian. He could be related to the father or mother, they had the same last name. He isn’t in any census, etc. The court simply says he was named the guardian but didn’t give a reason. I can’t find a relative dying at that time so can’t figure it out. It’s frustrating when you can’t find the triggering event, but you know there had to have been one: a death in the family, an inheritance, an entitlement to something coming to the children. Could the father have been mentally incapacitated? I have a Civil War pension situation in West Virginia where the widow was the guardian of the children until she remarried but state law required that the new husband become the guardian. The accounting for the use of the funds required of him is well documented in the file. Julia, I have a very different WV case. The mother remarried twice while there were children still under 16, and I found no indication that a husband was named guardian. Her widows pension ceased with the first remarriage. 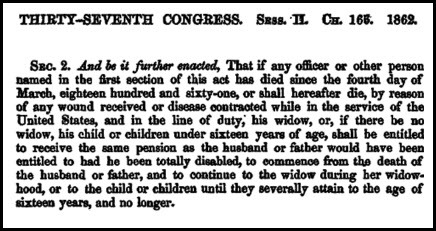 Not until 2 years later in 1872 did she apply for the stipend due orphans of a soldier who died while in service. At this time her second husband was still living. A totally unrelated person was appointed guardian and duly filed fiduciary accounts. He continued as guardian after her second hubby died and she married again. The same guardian continued until the last child turned age 16. Maybe I have not searched the court records well enough, but thus far have found no indication that either of the later husbands acted as guardian in the fiduciary sense (accounting for the minors’ funds). Judy, Thank you soooo much for this post/email. This has puzzled me for years. You are awesome and so is your blog! Thank you Judy for blogging my question and the rest of you for your questions and comments. For a follow up to my question, see my reply to Stan Baker. I totally agree with the laughable idea a woman shouldn’t manage such things if she was married (“coverture”?) but if she was single, then maybe she could. I also have a guardian case that I’m trying to puzzle through. Widowed mom was made guardian of three children in Iowa. She moved to Missouri with a new guy, married him, taking her children with her as far as I know. They moved back to Iowa after three years. After a couple years more, and three more children, she divorced number 2 for debt and desertion in 1864. In 1866, she resigned her guardianship of the first two children. The new guardian promptly sold the kids’ land. Her dower right was recognized. This all brings me to a couple of questions. Why did she resign the guardianship? Was this financial? I thought at first that maybe she couldn’t petition the court to sell the land on her own as a woman, but looking at other cases up for probate at that time, that does not seem to be the case. This led me to a second question. How financially onerous was a guardianship? I see a lot of security being required of guardians. This woman was living on the edge with five mouths to feed. But then, sale of the first two children’s land would have helped feed at least those two, wouldn’t it? I don’t see how resigning the guardianship would have helped her financially. Do you have any thoughts? Consider the potential here for a conflict of interest: if the land was sold, she might benefit by getting her dower interest. But selling the land might not benefit the children. So it may simply have been that. So are you saying that the resignation would be to avoid the APPEARANCE of wrongdoing? That she had someone else be guardian so that the land could be sold without her looking bad? And she would still get the dower portion? Without looking in detail at the documents (something I’m afraid I don’t have time to do), I’d at least consider whether she was legally hamstrung while serving as guardian. She’d have been bound not to act against the children’s interest and yet it might not have been in her interest. So resigning might have offered a way out. This isn’t a “this is what happened” scenario. I’m tossing this out as a possibility. Hmm. Interesting, and something I hadn’t thought of. Judy, A beautiful explanation of statutory morphing from our common law heritage.